As health-conscious as more and more people are becoming, they might not always find choices readily available to them to match a healthful, balanced lifestyle when they wish to dine out. Those with dietary restrictions who find it difficult to enjoy themselves when going out with friends may balk at the options thrown their way. After all, who wants dinner to consist of only an entree-sized "house salad" doused in Ranch dressing as the vegetarian option? 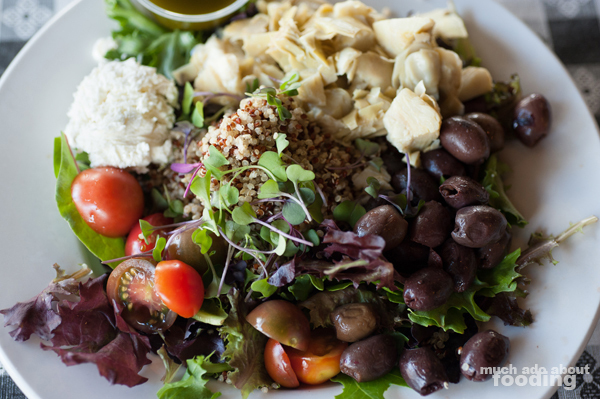 To bring in a wholesome food choice that is delicious and varied in menu while also being respectful of different dietary needs, Anita Allison and Joulia Kallah put their heads together for years and eventually opened the doors to Green2Go in Brea in 2012. They "took everything Americans love to eat like McDonald's (burgers), Taco Bell (tacos), and more" and made similar dishes in the healthiest, cleanest ways possible. That includes making all sauces in-house as well as ensuring they are organic and gluten-free. We sat down with Anita to learn more and were genuinely pleased at what we were able to taste - real food. 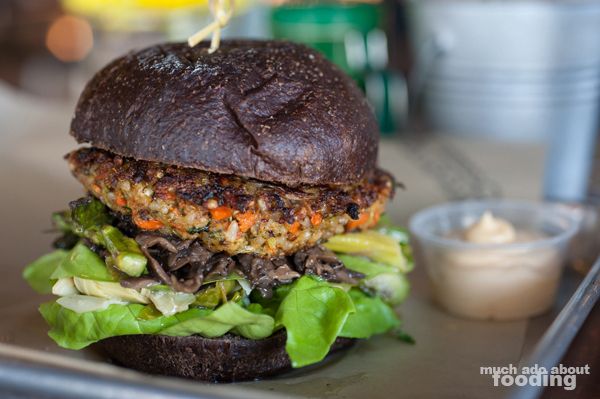 "We try to create the healthiest, most delicious, and cleanest food here. For example, our guacamole is only avocado, salt, pepper, and cilantro." The menu at Green2Go keeps a regular mainstay of favorites while specials are announced on social media and shared with guests during their orders. This way, the restaurant is able to maintain their clean food options for all of the guests that actually come due to difficulty finding eateries that can cater to their dietary restrictions while also ensuring that if you fell in love with something your first visit, you can find it again when you come back. We spoke to Anita whose favorite dish at the time was their tri-tip so keep your eye out for that one! One of the first things we noticed when we entered the Brea restaurant was the immense amount of art on the walls and the impressive bar area. Local art is displayed here which gives it a closer connection with the community. The beers are focused on being sourced from local craft breweries, and we were pleasantly surprised to see such a unique variety and even some rare ones on draft. Since Green2Go has a smaller volume, they are able to get one keg at a time of special edition beers so keep that in mind should you want to seek out a release on draft (yep, they are on TapHunter!). If you'd prefer to try a variety, Anita also informed us that they host beer pairing dinners along with the breweries themselves; that's quite the perk you get from working with locals! Personally, we went with the Ginger Peach Black Tea and Acai Green Tea to whet our throats which were lovely in their own right. If you have more of a liking for coffee, fret not - they do also carry Orange County local, Bodhi Leaf, on nitro! All the talk of fresh, delicious, and wholesome food had our stomachs grumbling so we had to dive into some plates to get a sense of their fare. The spread of options is varied and should tackle every sort of craving. One of the larger sections was dedicated to their many types of burgers - these housemade burgers are grilled to order with choices of brioche, squaw, or leaf lettuce as the buns. You can opt for their standard stack of organic lettuce, tomatoes, onion, and dill pickle or build your own with four choices from their build-your-own bar. Included is a side choice of a cup of their fingerling potatoes or a tossed house salad. Buns not your thing? You can also throw a patty onto their mac and cheese or turn them into sliders on King's Hawaiian roll buns. Curious, I needed to try out the House Veggie Burger ($11) in the build-your-own style. With a slather of house Pacific Island dressing, the squaw buns (made of real squaw and molasses) were stacked with the veggie burger patty (red quinoa, white quinoa, fresh vegetables, gluten-free brown rice), roasted Brussels sprouts, sauteed mushrooms, artichoke hearts, roasted asparagus, butter lettuce, and mixed greens. The burger itself is quite popular at Green2Go because the patty doesn't contain "filler" as other vegetarian patties due; this one is also seared in grapeseed oil before being baked in the oven, ensuring a crunchy exterior. I truly enjoyed it and the thick squaw bun which had a hint of sweetness. Because of all of the components built into the patty, the burger was hearty and filling; this is a definite "order again" in my book. If you prefer the meat-based type of burger, you'll be happy to know the beef patties derive from grass-fed beef. Another community favorite is the selection of tacos. These are made in a slightly different manner. Atop their grilled organic corn tortillas (or leaf lettuce, if you prefer), proteins are stacked on housemade kale slaw tossed in a sesame ginger dressing, housemade guacamole, and fresh pico de gallo. Coming in at $5 apiece, the taco is no small street taco-sized thing but rather, a loaded plate for the appetite. 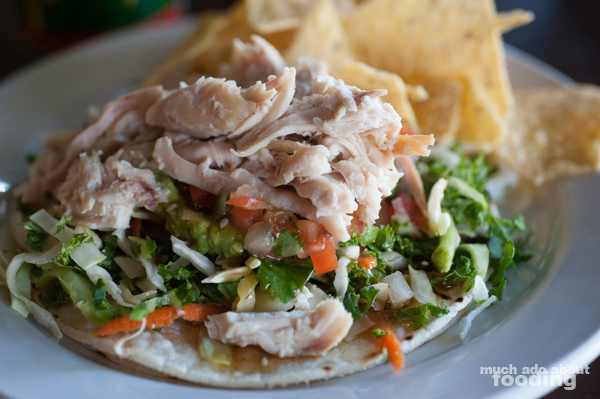 The Chicken Taco ($5) featured roasted chicken that had been shredded and then sauteed with some house pico de gallo. It was moist and flavorful, and the crunchy slaw gave a textural balance to the otherwise tender meat. 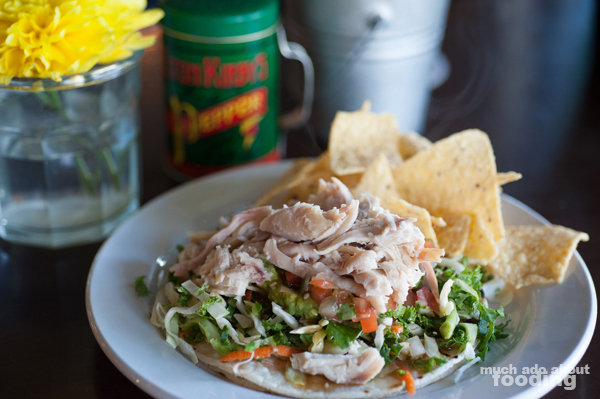 We thought the dressing was a change of pace for tacos that may be exciting to some or just an indifferent addition. Just the two of those plates were surprisingly plenty for our stomachs because everything was so nutrient-dense. However, we needed to see the beautiful salads of which there were plenty on the menu as well and opted for the Organic California “Chop Salad” ($13.50 - quinoa. cucumbers. tomatoes. artichokes. Kalamata olives. Feta, G2g vinaigrette, and toasted ciabatta). This comes without being pre-tossed and all of the elements are sectioned off so you can choose what to do with each; I just tossed everything together because every ingredient was enticing to me. Full of freshness and a well-planned mix of vinegary, savory, tart, sweet, etc, this was certainly a salad I could do with every day. Anita stressed the greatness of their dessert menu so you should take a gander yourself. Green2go makes their own sea salt chocolate chip cookies, grated ginger snap cookies, flourless chocolate cake, and berry cobbler. They also are very favored for their banana bread which can be purchased as muffins or miniature loaves to take home. We tried some bites of their Berry Cobbler which came with a generous scoop of organic vanilla ice cream, and it was over at that point. 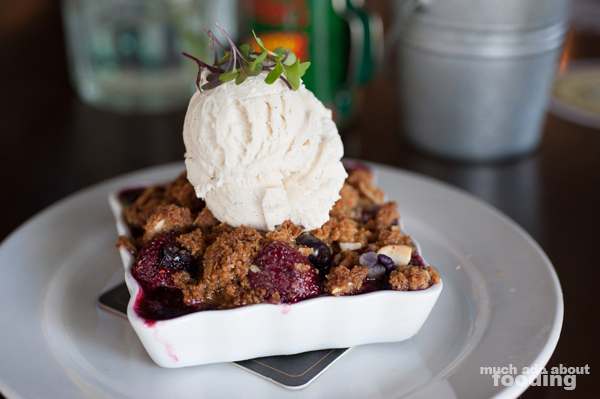 We couldn't just have a taste; we devoured the entire cobbler, berries, streusel, and all. As Green2go continues to make wholesome, delicious food, we hope they will reach their goal of expanding out into Irvine. A meal prep service is in the works as well for the restaurant so that their quality food can be out and about during busy periods of their community members' days. If you are interested in visiting, they can be found at 2435 E Imperial Hwy, Brea, CA 92821. 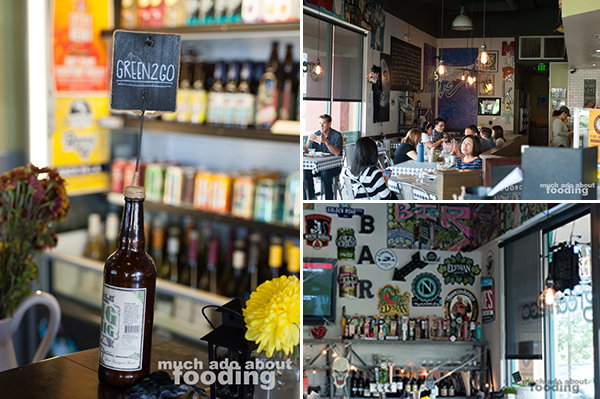 With so many options, the restaurant is sure to have something for everyone so bring some friends as well!